From bonobos to Underground Railroad conductors and Holocaust rescuers, primates have welcomed strangers since time immemorial. Today sanctuary and asylum continue this ancient tradition. As a secular legal institution, asylum is under threat; but sanctuary, a predominantly religious practice, thrives even under dire conditions. What is the future of these institutions in light of recent crises and political developments around the world? Linda Rabben is an author, human rights activist and associate research professor of anthropology at the University of Maryland. She did field research in Brazil over a 25-year period and worked for Amnesty International, the Rainforest Foundation, Lutheran Immigration and Refugee Service, and other NGOs on human rights, migration, environmental and international development issues. Since the late 1990s she has published eight books about human rights, including Fierce Legion of Friends: A History of Human Rights Campaigns and Campaigners. 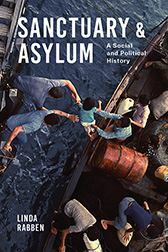 Her new book, Sanctuary and Asylum: A Social and Political History, was published by University of Washington Press in September 2016. She has spoken about migration issues to diverse audiences in the US and UK.